At Kings Cross 1988 - Charter Brisbane /Sydney/Brisbane return. Last edited by dominodc122 on Sun Apr 14, 2013 10:20 am, edited 5 times in total. Thanks to CJT for this image...anyone know the unit#?? Last edited by dominodc122 on Tue Apr 09, 2013 6:23 pm, edited 4 times in total. All we need now is some photos of the Dennings and the Scanias with Austral Tourmaster bodies and the single deck PMC's and we'll just about have the complete variety of coaches Sunliner operated. Anyone else have any photos of Sunliner units.? Chris did you get my emails ? Hi Chris, The guy standing on the left is Alex (cant remember his last name)Unknown female - Jenny is standing next to Phil. Sunliner 234 brand new at 1989 Bus Show Sydney- before it burnt down after a accident in Nambucca Heads later that year!! From memory the proprietors of Sunliner Express were also involved in the ownership of Bayside Bus Lines in Brisbane and Peninsula Bus Lines on the NSW Central Coast. Recall that Landmark Tours from Melbourne were also involved. Chalmers Coaches operated TV100 Denning Denair on the Sunliner Day Tours program in Sydney. It was later replaced by TV204 an ex VIP Scania K112TR / Neoplan. Thanks for that David10 - some good insight into a great company and great people! Please post the earlier info that was posted regarding the sunliner day tour ops in sydney ! TV100 was the denning and was simply kept as a spare when the neoplan was utilised for the day tours in syd. Sunliner owned and operated a bus company - East Killara - Lindfield that was the old Chalmers Depot at Gordon, also used as a express depot for changeovers and some maintenance work when needed in Syd. 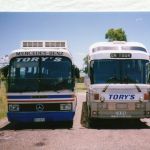 A third vehicle was the old Chalmers tourmaster in chalmers stripes in the fleet along with a scania 5 speed CAG gearbox 57 seater single axle custom coach bodied semi-coach that ended up at southtrans in syd south. The day tour operations focused on the blue mountains tour and offloaded the other day tours to the other operators in the syd market. as I was one of the sydney day tour drivers before moving over to Clipper tours and touring Australia with them. Alfy - are you talking about the brochure on the previous page for Sydney Day Tours?? Another of our "ex girls" - anyone know what sunliner unit number she was?? Last edited by dominodc122 on Tue Apr 09, 2013 6:48 pm, edited 1 time in total.